Rummy is a popular game in India and it certainly does not need any introduction. In almost every Indian family, we all have played a game of cards either with family or friends. 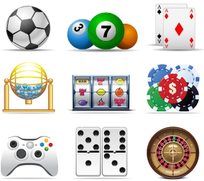 With online gaming making it big, people prefer to play their favorite rummy game online. So, it is important for a player to know how to play indian rummy game online and understand different versions of the game. Rummy is a game of skills and it needs tact as well as a strategic calculative mind. So, the Indian version of rummy is 13 cards rummy. 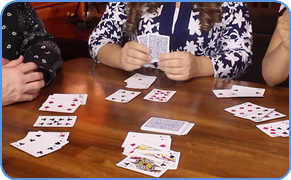 It is generally played between 2 and 6 players and cards are dealt in a manner where each player gets 13 cards each. If there are more than 2 or 3 players then 2 decks of cards can be used or else a deck of card is good to go with 2 or 3 players. Once the cards are dealt, then remaining cards are left on the table faced down to form a closed deck. The wild card joker is selected at random from the closed deck of cards and it can be used to replace or as a substitute for a missing card. Once this is understood, then rummy is simple to play. The main objective of this game is to make sets and sequences out of the 13 cards which are dealt with by the players. 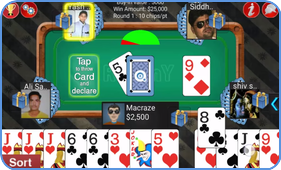 Once all the cards are used by players to form sets and sequences, the player can declare the game. A sequence is a set of 3 or more consecutive cards of the same suit arranged together. A set is formed when 3 or 4 cards of the same rank but different suits are arranged together. On the right picture: Family playing rummy card game at home. Once the cards are dealt, the player to the left of the dealer has to initiate the first move. 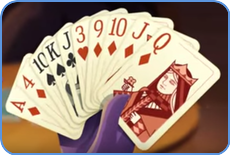 As the first move, the player needs to pick a card and it can be done either from the closed deck or from the open deck. Once the player picks the card, then he/she needs to discard an unwanted card from his/her hand to the discard/open deck pile. Thus, the players make their moves in a clockwise direction. On the left picture: Indian rummy card game online tournament. The winner is declared on the basis of who can arrange all his cards into valid sequences and sets. The declaration has to be valid with all the 13 cards arranged in valid sequences and sets and it should have a minimum of 2 sequences out of which one is a pure sequence. These are just the basic rules of Indian rummy and rest depends upon your interest to learn. You can register at any online rummy website and start playing for free and then shift to playing for real cash. So, register today and enjoy the fun of playing Indian rummy online.